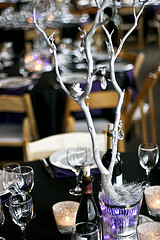 The great thing about cheap wedding centerpieces is that brides are getting more and more creative. The same old amazing floral centerpieces are great if you have the money but when you are planning a cheap wedding you need to use your imagination. 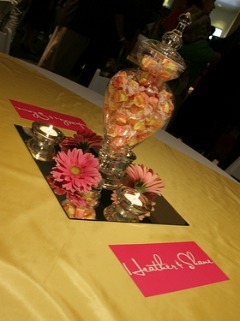 A great look that fits with any color scheme is to have glass jars or bowls in the center of the table filled with candy that matches your theme, or it could be your favorite candy! One bride I knew had to buy all of the candy again for her wedding as she kept just having one more! To make the jars look more decorative you can tie a ribbon around the top. Your guests will love that they can help themselves through the reception, the children will love it even more. If you love the idea of having flowers but just can't afford to have a professional then look at buying cheap glass vases and submerge the flower heads in the water. Small as in very tiny glass vases are great for just holding one flower head; daisies, roses, hydrangea all look great by themselves. You can then group them together on the table and scatter petals between them. More brides are looking to have a statement piece as their centerpiece; birdcages filled with ivy and flowers,hurricane lamp,moroccan lamp, andgoldfish bowls are all great starting points to make your display. The lamps work great by themselves, especially at an evening reception. 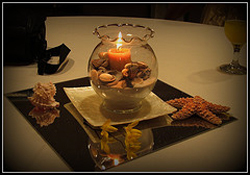 Goldfish bowls can be filled with water and floating candles, petals and even candy - some brides have even had goldfish swimming in them, look great but what can you do with them after? You can fill the bowls with anything that fits your theme, you could have a pillar candle and then have pebbles or even Christmas sparkly decorations around the edge. A great way to make your own dramatic centerpiece is to secure a branch into a pot or vase and then hang extra decorations on the branches. These could be tealights, photos, flowers, just use your imagination. You can spray paint the branch to match your theme and secure it in the pot with air drying clay. Dried flowers scattered on the table with pillar candles is great for a rustic wedding. Framed photographs are a cheap idea and a good one to get your guests chatting. If you are super organized you can have photos of the guests from each table as well. Finding a copy of their own wedding photo at the table would make the day even more special. There are so many different twists on these themes that would work great for your wedding. Just think about what would be fun to have as your cheap wedding centerpiece and go ahead and play until you are happy with your design.